Apple CEO Tim Cook has always been keen to make sure the world knows that customer satisfaction is high when it comes to Apple products, and now we have further confirmation of the point after a report by the American Customer Satisfaction Index confirmed that the company is at the top of the pile when it comes to PC and tablet manufacturers. The report scores companies across a number of customer experience factors with Apple coming out top with a score of 83, the same as it did in last year’s report. However, this doesn’t tell the whole story with Amazon snapping at Apple’s heels with a score of 82. This comes thanks to its line of tablets in particular, with customers saying that they are particularly satisfied with the design, ease of operation, and sound/graphics quality on the company’s line of tablets. Samsung also found itself tied with Amazon with features such as the operating system and pre-loaded apps being what let the company down when compared with Apple. 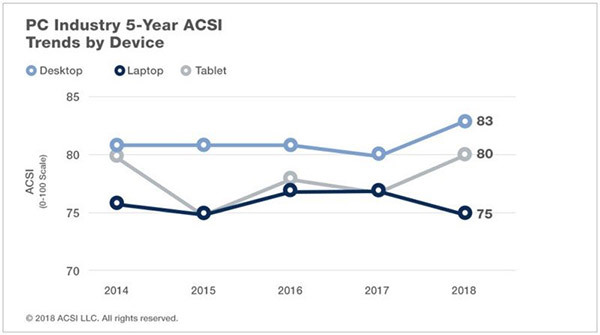 While it’s always important to take these kinds of reports with a pinch of salt, this one from ACSI comes thanks to data from around 250,000 customers with more than 380 companies and 46 industries involved in the scores. If Apple manages to come out on top, for the second year running, it’s not a fluke. In a similar vein, Amazon’s continued rise up the charts should be a concern for Apple, with the retailer releasing more and more products each year.